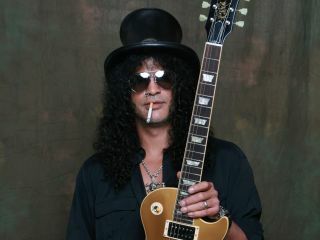 Slash: Hat? Check. Cigarette? Check. Les Paul? Check. Hot on the heels of Gibson's Dark Fire revelation comes another first of its kind from the guitar giants: a free album download. Gibson Presents: Hot Tones In High-Definition features 14 tracks by some of Gibson's finest endorsees including Sonny Landreth, Eric Johnson and Slash. So called 'High Definition' because of the partnership with the album's distributor HDtracks and the three high-quality formats you can choose to download it in: AIFF, FLAC and 320kbps MP3. You've got until 6 December to get your free download after which the "album will no longer be available with no plans to redistribute it in any format." Get it while you can, then.